America should take care of Americans first and not give foreigners advantages over US citizens. The US Visa programs have been used by corporations and a complicit Congress & President to sell out American intellectuals and skilled service workers and perhaps even worse than that, recent American College graduates. The scam continues even now while Americans are unemployed in record numbers. The Visa Program had noble beginnings and there is no obvious problem with the type of people who come in on visas. However under certain visa types, employers get a big bonus as they can access foreign technical talent for slave wages while putting well schooled and talented Americans out of a job. When I was an active IT Consultant, one of my clients was able to obtain an H-1B visa for an executive from South Africa. He was a very bright guy. They were not the nicest of employers. His salary was about 1/3 of the other executives. Why was that? Because he was in many ways an indentured servant to the company. If he messed up or made any demands, they held the rights to his visa, and they could deem that he be sent back to South Africa at the drop of a hat. As a demonstration of how endearing this company was to this foreign national, when he finally became a citizen, he immediately gave his notice and moved to Florida. They could not do without him. You know what they say about payback. They agreed to pay him a full executive salary while in Florida so that he would run their sophisticated purchasing software over the Internet for them while he had a real full time job in Florida. Some stories work out well. Could not have happened to a lousier bunch of guys. The point is that foreigners will work for substantially less wages than their American counterparts in high tech jobs. Engineers, computer techs, and many people in many other occupations want to live in America, and they will make whatever deals they can to become citizens, They don't simply cross the border illegally. They make lots money more than where they came from and most are placed on a track to a green card and ultimately citizenship. As with my friend, those on such Visas do not have a real picnic before they get citizenship. Their job is to please their masters who know their plight and they know they are ripe for abuse in the workplace. They will almost do anything not to be deported and so they do what they must to satisfy the whims of their corporate sponsors. It is not fair to foreigners as they can a bad taste of American capitalism and it is not fair to Americans because great talent is left on the bench while foreigners are working. One of the first spigots that should have gotten shut off when the US entered this recession three years ago was the influx of legal foreign workers. Who needs 'em when Americans are unemployed? But, our Congress took no action even as the unemployment rate shot up to 10%. Yes, our Congress has been complicit in the Visa programs that kill American jobs and which take advantage of the job receivers. It is only fair that this pitiful Congress should be left jobless after this next election and perhaps somebody will pick them up for the minimum wage, or hopefully a lot less!. In my book, Taxation Without Representation, I wrote a chapter on how American corporations exploit foreign workers as well as Americans with their special government sanctioned Visa worker programs. There are over 80 different Visa programs and the H1B is just one program that brings in 65,000 at time each year. For a few years Congress permitted over 100,000 per year. Recently some of our trade agreements, such as the WTO, have insisted on our continuing use of the H1B program to help foreign nationals be able to be hired in America. And, thus some experts suggest that we cannot summarily stop the H1B spigot. Yet, this hurts Americans and so as a sovereign nation in recession, we can do what is needed to help our country. If only our Congress understood that. As with most trade agreements, the WTO was all one sided as again we were snookered by our "adversaries. I have discussed this with my Marywood classes and the conclusion is that in trade talks, the US negotiators, are the worst able at the table. It is as if they are programmed to lose. I suggest to my class that it would be far better for the US to substitute a huge block of granite for our negotiators for the granite would do a better job. It would have served America's needs far better than the losers who actually sat at the table. Merely by agreeing to nothing we would be far better off, and granite cannot agree to much. The H1B is a terrible fraud perpetrated against America's best and brightest workforce, its recent college graduates. It is a program that at any point in time is sapping over 400,000 jobs from the economy. It is a travesty for American workers but especially bright students graduating from America's finest Universities. They are unemployed while they find their potential jobs being taken by foreigners on Visa programs so that corporations can save money on wages. Congress has been convinced by Industry that more and more foreigners are to be permitted into the US because Americans are just too dumb. Quite frankly, Congress is too dumb to understand that our best science, technology, engineering, and math students, those in the (STEM) fields are not getting the chance to perform because American corporations believe they will cost too much. So, our kids sit on the bench while somebody's kid from Hong Kong, or Egypt grabs the job that our 4.00 students aspire to. They work for 1/3 the wage so you can get three brains for the price of one, and that is the rationale behind the corporate love of H1B visas. As ana side, the worst corporation in America on Visa abuse is Microsoft, but IBM is not too far behind. And, yes, there are many times when the new H1B worker comes in and replaces an American for a salary substantially less. This is not only abuse of the Visa programs, it is age discrimination. I have seen situations in industry in which the American has the pleasure of training the foreigner prior to his or her getting fired. It is surely not the way it is supposed to be in America. 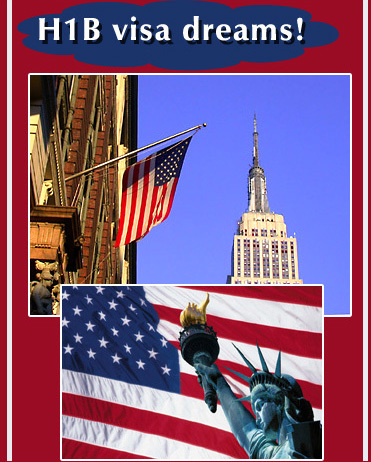 For the Fiscal Year 2012 (FY 2012), the US is currently accepting applications for H1B visas. I find that hard to believe. The H1B is a nonimmigrant classification used by an alien who will be employed temporarily in a specialty occupation or as a fashion model. Too bad nobody in the US can fill the bill. This really is un-American and it shows the lack of concern our legislators have for the plight of the American worker. Congress is still bringing in 65,000 foreigners a year under this one of 80 Visa deals to take American jobs. Ask Robert P. Casey, Jr. about that! Pennsylvanians are losing their jobs because of this and the rampant age dicrimination in brings in as older workers are dismissed. I have become an expert on this last point. The filing deadline for H1B visas for Fiscal Year 2012 (FY 2012) was April 1, 2011. Under current law, an alien can be in H1B status for a maximum period of six years at a time. After that time an alien must remain outside the United States for one year before another H1B petition can be approved for the same person. Certain aliens working on Defense Department projects [DOES THIS MAKE ANY DEFENSE SENSE?] may remain in H1B status for 10 years. In addition, certain aliens may obtain an extension of H1B status far beyond the 6-year maximum period. I have been teaching in Colleges and Universities as a Lecturer for at least thirty years. Seven years ago, I accepted a position at Marywood University and was quickly made Assistant Professor. Sometimes Americans just cost too much. This year, I am being replaced by a very young foreigner, who I believe is in the US on an H1B visa. Congress, in its infinite wisdom, decided that there would be no cap on the number of University Professors who could come in under the H1B program. So, it sure looks like an American was replaced by a foreigner and that is happening all across the country, both legally and illegally. The current law limits the cap of H1Bs to 65,000 as the number of aliens who may be issued an H1B visa or otherwise be provided H1B status in a given year. There are 80 plus other Visa programs. How can COngress permit this when Americans cannot find jobs? Ask your Congressman. BTW, because Visa holders are documented, is that why border jumpers are called undocumented? What about the Visa holders who just never go back, and the just blend into the US landscape? Does documentation really matter to the unemployed American worker? I'll be able to tell you soon. "The big difference between losing your job to a person with an H1B Visa and having your job offshored is whether the person who gets your job will be playing a home game or an away game. If they get to work in their own country, say India for example, then for them it is a home game. Your job has been offshored. If instead, they get an H-1B Visa, then they get to come to the U.S. to take your job. In the latter scenario, however, your company or the company that would have hired you first must lie about your availability to work or they would not get the H-1B Visa slot. The next lie is that they will pay the H-1B Visa worker or any other work Visa, the same pay for the same work you would have done. Hah! When has Robert P. Casey Jr. suggested that this might be an issue for Americans? Who has ever told you this is an issue? Let me be the first if you have not been exposed to this travesty before today. I wrote about it in my book and I say it again for all to hear. The way this program is used is a travesty. We are not talking about students. Sometimes we are talking about Professors who will work for peanuts. We are talking about workers who are in advanced areas and for the promise of a green card or the right to eventually live in America, they forego six years working for minimal wages while better qualified Americans remain unemployed. Americans expect to make a decent wage and none of us are depending on the good will of a corporate manager to decide whether we get put on a fast track to citizenship. Thankfully we are already citizens but our Congress denigrates us and denies us our natural opportunities. Can we not all agree to send all 435 members of Congress and the 100 Senators home packing as soon as we can until this and many other problems can be resolved. Congress thinks this is OK therefore Congress must be fired. November 2012 is our next chance to get most of them out. Let's promise to get the rest when their time comes--for the harm they cause American workers. By the way, the H1B visotors that do what they are supposed to do and leave after 6 years should go home loving America, but they have been misuesd and they know it. So, how is this good for America? It is good only for greedy corporations and the politicians that they own. As with all the problems we identify on this site connected with Jobs, there are also essays on this site that offer real solutions. Your current Congress so far has not concentrated on making the jobs picture better. So, let's make sure they do not have the opportunity to keep US down in the future. For Pennsylvania, our next day is primary day, May 18, 2012. Take out the bad guys from your own party so that it almost doesn't matter who wins the general election in November 2012. Make sure you take the time to vote. After I wrote the first version of this article to help make Americans aware of how badly our representatives treat Americans regarding the protection of our jobs, I noticed that there are few areas in which Congress excels. So, I wrote a new book called Americans Need Not Apply, and this book takes a hard look at both legal and illegal immigration and its impact on jobs in America..
One of the greatest pieces I read on this topic of H1B immigration visas is on www.numbers.com. It is titled: "Why does the US Restrict H1B Visas? To Protect American Workers." Feel free to take the link. It is very revealing. "A policy that limits too many smart people coming to the United States is questionable." "I'd certainly get rid of the H-1B visa caps." "It's no contest. We're in the business to make a buck. American labor can't compete." "I think a very important part of the productivity gains in the past decade were associated with our open immigration policy,"
"(Not all of the) unemployed are capable of doing the jobs for which H-1Bs are being hired. Workers are not fungible that way," Brown said. "Sometimes the best person for the job just happens to be born elsewhere." There are Just No U.S. Workers to Choose From! Some argue that H-1B workers displace American workers and lower American workers’ wages and working conditions in certain job sectors. It is hard to displace U.S. workers when you don’t have any U.S. workers to choose from. Who is Telling the Truth About H-2B? "There are a lot of myths that these guys [H-2B visa holders] are replacing American workers." Maria P. Candler, vice president for operations of the Williamsburg Colonial Village. "It does [H-2B] allow employers to evade the basic rules of the capitalist market Typically, if you have a hard time finding workers, you have to offer better wages and working conditions to attract them. Employers in the H-2B program don't do that." Companies here don't want to pay high salaries to American workers, so they recruit Hispanics who will work hard for less pay. The wages, though, are still much greater than in Mexico." Patrick P. Gelsinger, the chief technology officer of Intel, told the New York Times that he isn't concerned about the security risks of H-1Bs or outsourcing because because the cost of one engineer in the United States would pay for the services of three Indians, four Chinese or five Russians. "If their job [H-1B] is terminated and they're laid off, according to the Immigration Service they are immediately out of status and are supposed to leave the United States". Litwin says U.S. law is not specific about when they have to leave the country, and there's virtually no enforcement. So many stay as long as they can, hope to find work, and then try to get new H1Bs. And yes, they do compete against Americans for work, but Litwin says that's good for business. author of "Debunking the Myth of a Desperate Software Labor Shortage"
There is indeed salary exploitation in many cases, but that is not the central issue. THE CENTRAL ISSUE IS AGE DISCRIMINATION. EVEN IF EMPLOYERS WERE TO GIVE FULL SALARY PARITY TO H-1BS, THEY STILL WOULD PREFER TO HIRE YOUNG H-1BS OVER OLDER U.S. CITIZENS AND PERMANENT RESIDENTS. Employers would still prefer hiring a 25-year-old H-1B to a 45-year-old American, even if they pay the 25-year-old H-1B the same as 25-year-old Americans. Many [companies] really love having indentured servants [H-1Bs]. They don't just love the chance to exploit H-1Bs in terms of salary; EVEN MORE IMPORTANT THAN SALARY IS THE FREEDOM FROM FEAR THAT THE H-1B WILL SUDDENLY LEAVE FOR ANOTHER EMPLOYER, CAUSING A MAJOR DISRUPTION TO THE CURRRENT EMPLOYER'S PROJECT, AND MAYBE EVEN TAKING THE CURRENT EMPLOYER'S TRADE SECRETS TO ANOTHER COMPANY. Many people don't realize just how powerful an attraction this is to employers of H-1Bs. ANY INCREASE IN THE NUMBER OF FOREIGN-NATIONAL WORK VISAS WILL SIMPLY EXACERBATE THE AGE DISCRIMINATION PROBLEMS. Other than Norman Matloff and a few others, hopefully you have concluded that America cannot afford to put anybody who feels this way in charge of even our favorite pets as they will create an issue where there should be none. And, pets are very important to most of US. If they ever did, our leaders, for the most part, do not now have the best interests of America and Americans at heart. Some of these people in the quotes are in Congress now, or the were in Congress at one time, but those who were never part of Congress spend an awful lot of time lobbying our legislature to help them choose to give all good jobs in this country to foreigners who will work for peanuts. Then, they wonder why their kids cannot get an honest job in America! Why is it this way? it is beyond comprehension. Americans are not dumb! Congress can only conclude we are dumb because they take and take and take from us. They give little to nothing back, and we reelect them. Let's stop that and then let's see who is so smart!